My name is Bill Harveson. I currently have a clock and watch repair business in Homosassa, Florida. I also sell antique and vintage clocks there and on eBay . I became interested in clock collecting about 20 years ago when I inherited a couple of old clocks from a family member. I took them home and wound them both up but they refused to run. I was living in a small town in Arizona at the time that was the home of a small antique clock shop. Eventually, I stopped in with my two clocks to get them repaired. This was my first experience visiting an antique clock shop. I now know there aren't many of these left in this era of large antique malls and cheap throw-away clocks. This particular shop is in Old Town Cottonwood, AZ. After a few trips to that shop, I became hooked on clock collecting. During the next few years, I made frequent trips to the shop and eventually became friends with Charles, the owner. Charles is a certified Master Clockmaker who has owned the 'Time For You Clock Shop' for almost twenty years. He took note of my interest in clock repair and asked if I would be interested in learning the trade from him. My job at that time gave me a fair amount of free time, so I agreed. For the next several years, with great on the job training, I learned a lot about clock and watch repair from Charles. I also learned about the history of clocks and watches from the many books available to me at the shop. 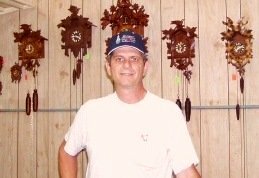 In 2006, I moved to Florida and started my own clock and watch sales and repair business . I continued researching clock history which was helped tremendously by joining the National Association of Watch and Clock Collectors (NAWCC) . They are a great source of information for anyone interested in horology. I know most of you visit this website because of your interest in clocks, but I have been getting a lot of questions about my website and how I can provide all the information I do free of charge. Most of my time is spent buying, selling and repairing all types of clocks. But my true passion in life is collecting clocks. I wanted a website to share this passion with other clock collectors and enthusiasts. The only problem was my total lack of knowledge of how to build a website. One night, as I was searching online for information about building a website, I stumbled onto a company that not only hosted my website, but taught me how I could do it successfully myself. At the time I didn't know what a stroke of luck this was. I know I still have a lot to learn, but I hope you enjoy this site and come back and visit often. I am always thinking of new topics you (my visitors) might want to know. Eventually, I would like to build a thriving antique clock community. So even though I spend a lot of time providing free information to anyone with an interest in clocks, it doesn't cost me anything to keep it up and running. The small amount of ads on the site more than take care of expenses. You probably used a search engine to find Discover Clocks. If I didn't find a great company that took care of all the tedious details of submitting all my pages to all the search engines, if I wasn't taught how to write my pages the way search engines love, you would not have found me. Attention, clock and watch enthusiasts. You are invited to sign up to receive "Clock Collecting Tips". This isn't just another e-mail cluttering up your in-box. I only send it to you when I have something I think would be of interest to you, the clock or watch collector. It’s free and I promise your e-mail address will never be given out or sold. You can also check out the back issues by clicking here. Need more information? Search this site. If you have a suggestion about a topic you would like to see on this site in the future, please take a moment to let me know in the form below. If you have any questions or comments about this site, I would also like to here from you. Your privacy is respected here and is explained in the Privacy Statement here.